Albert Whitman & Company, 9780807509043, 32pp. "Maybe I'm not the hero type. But I can dream. Sometimes I dream I'm a rescue dog, saving a child lost in the woods. Or a guide dog, helping a person who cannot see. Or a police dog, tracking sneaky robbers. But when I wake up, I must face the truth. It's mostly big dogs who do those jobs. And I'm just Barnaby, a small mutt living in an animal shelter." 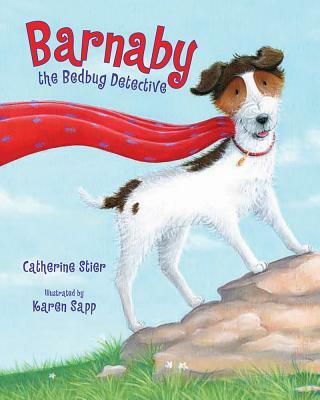 Barnaby has big dreams, but he finds his true calling when he's adopted into a loving home and becomes a bedbug-sniffing dog—helping to find hidden bedbugs in hotels, on airplanes, in movie theaters, and even in people's homes! Catherine Stier is the author of Bugs in My Hair?! ; If I Ran for President; If I Were President; Today on Election Day; and the Terrible Secrets of the Tell-All Club. She lives in San Antonio, Texas. Karen Sapp is the illustrator of numerous books for kids, including Who Is Sleeping; Wide Awake Jake; Polar Bear Paddle; and Ed's Egg. She lives in England.